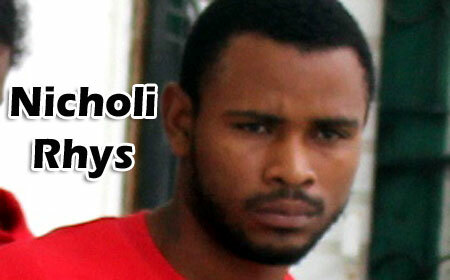 BELIZE CITY–Nicholi Rhys, who was charged with the high profile murder of the South Side Gangsters (SSG) leader Andre Trapp in June 2010, was remanded to prison today on a charge of robbery. Rhys, a resident of 7 Tigris Street, pleaded not guilty to the single count of robbery when he appeared before Chief Magistrate Ann Marie Smith. The court prosecutor, Corporal Christopher Smith, however, objected to bail being granted to Rhys, on the grounds of the seriousness of the offense, and the fact that Rhys has another similar case pending before the court, and if he is granted bail, there is a strong possibility that he would commit another similar offense. In an effort to secure his freedom, Rhys asked the court not to remand him to prison, because he presently has a construction job. Chief Magistrate Smith upheld the prosecutor’s objection and remanded Rhys into custody until his next court appearance on October 21, 2014. The allegation against Rhys is that on August 26, 2014, he robbed Delon Lockwood of a gold chain valued at $2,000. Lockwood reported to police that he was walking on King Street on Tuesday, August 26, when he was hit in the head by a man who robbed him of his gold chain and ran off. Rhys, the accused killer of Andre Trapp, who was gunned down in the vicinity of the Magistrate’s Court, became the second person to be tried by a judge without a jury for his alleged role in the murder. Chief Justice Kenneth Benjamin, before whom Rhys was tried, freed him of the murder charge after a confession statement that he gave to police was not admitted as part of the evidence against him. There were also questionable identification issues in the prosecution’s case. Rhys’ other case before the court is for handling stolen goods after police found him last year September in possession of an iPhone that was stolen from Earl Perez.